Is turning on the waterworks a good thing? “Big boys don’t cry.” That was the mantra we were raised on back in the days when the web was something you found in the dark corners of a garden shed. 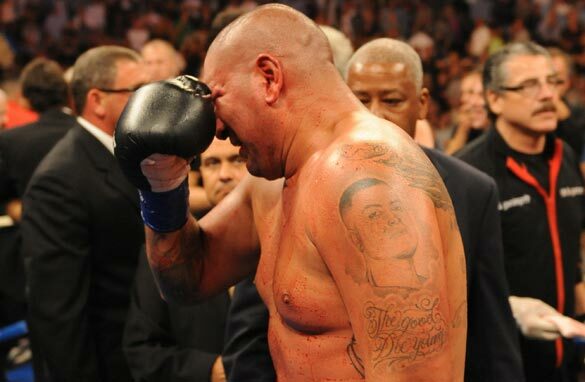 Cris Arreola breaks down in tears after losing to Vitali Klitschko in Los Angeles. So when we bumped our heads, skinned our knees, or didn‘t win the sack race on school Sport‘s Day, we were expected to grin and bear it without the need for fluids. Well, times have changed and I’ve got kids of my own now. And there’s absolutely no way the “big boys don’t cry” mantra will fly, because everywhere you look someone is wailing. The latest example came on Saturday night, when Mexican-American heavyweight boxer, Chris Arreola, a 6'3", 251 pound bruiser with a face only a mother could love, (and then only in dim light), bawled his eyes out after failing to relieve Vitali Klitschko of his WBC world title. It didn’t help that Klitschko is the very definition of stoic so that Arreola looked like a big cry- baby by comparison. But all the same, watching the self-styled “Nightmare” from East L.A, dripping on the shoulder of his coach after his title-dream was convincingly shattered was uncomfortable to say the least. But then I started to think about it, and realized that while he might have looked like a bit of a grizzle-guts to Generation-X’ers like me, the 28-year-old was only doing what comes naturally to those born in Generation Y. Crying in public has become as common among role models as scandals and bling, and sports stars who blubber in front of the cameras are just complying with the social norm. Look at the more recent examples. Roger Federer loses to Rafael Nadal in this year’s Australian Open final, and weeps like he’s just lost his favorite uncle. Granted, Roger is a serial sobber, but this was his finest hour and he took next to no flak for it. And so it continued. NBA legend, Michael Jordan, marks his induction to the Basketball Hall of Fame, with a tear-stained acceptance speech. Habitual retiree, Brett Favre, departs the NFL, for the first time, in a flood of tears. John Terry misses a penalty to lose Chelsea the 2008 UEFA Champions League final, cue the waterworks. Now obviously, there’ve been notable incidents of crying in sport in the more distant past. 17-year-old Pele howling when he won the FIFA World Cup with Brazil in 1958; Paul Gascoigne welling up when he was yellow carded in the 1990 World Cup semis; Oliver McCall blubbering so hard during a heavyweight bout with Lennox Lewis in 1997 that the referee stopped the fight! But these were exceptions to the rule. And, in the cases I’ve mentioned, easily explained away by youth or mental instability that became apparent later. However, in today’s society it seems you don’t need to be young or bonkers to turn on the taps, you just have to be human. And I’m still not sure whether that’s a good thing or bad thing. This just show that humans were created with emotions. The only question for peolple is the appropriate time and place to display emotion... In sports, I don't see problem with people breaking out in tears for joy or defeat. What does this mean in public?... In defeat, it means one should work hard to avoid defeat. For the subject person, it means release of stress rather than supressing then blurting it out dangerously. Try this. next time if your agry, upsat, it dosent help you. the only thing you have to do work hard in the exercise. learn more to fight with tall boxers. But still Vitali Klitschko was toller and smart boxer. Why you can't give him some resptect? why you needed to say something like... "Chris Arreola, a 6′3″, 251 pound bruiser with a face only a mother could love, (and then only in dim light)"
Obviously you didn't see his kids and wife next to the ring please keep for yourself those kind of comments, or use them on Oprah. dude, why should this be bad? do you like man to be machos? No way... Maybe in your generation and time that was the rule, not now, we have our own rules this time around. Try to adapt instead of questioning the whole thing. We are all humans, that's all!!! I just read an article lately, that quoted a study which found, that those people who can express sadness (such as crying) will be quicker to recover from trauma than those who don't/can't. Funny article. Obviously, most of the guys commenting don't have a sense of humor. IMHO, better out than in. Letting out your emotions is supposedly a healing thing. Plus i don't think your correct when you say crying when you lose is a generation Y (whatever that means) thing, the archives are filled with grown men letting the tears flow, i'll admit maybe not in boxing, its weird and uneasy seeing a pugilist cry, but other sports are and have been riddled with sobbers. Heh! Get Real! Let's face it nothing is funnier than seeing a tough guy blubber – male or female, because we always regard them as the bullying kind. We're conditioned into that way of thinking. I don't know who came up with this mantra 'big boys don't cry'. What an unfair cross to bear. But you know something, there is this thing called 'pride' which should be the deciding factor in this argument not something handed down. This is supposed to be the age of male and female equality so if you guys out there wish to let your emotions flow freely then that's nothing to be ashamed of, the only thing is contain it until you can get some place where you won't be judged. It's only human for athletes to cry after-all they are human beings as well. so with all due respect to terry baddoo, I don't think this article adds much value however it did make us reflect and comment which was probably terry's objective in the first place. it Shows that heroes are also human being.They cannot be absolved from it either in public or in private all is crying. I am happy to see a hero cry in public for it shows that he has also been conquered. When they do it in private one do not see them kicking the walls and hence hurting themselves,e.g Wayne Rooney when he was taken out of play by Sir Alex Ferguson and he kicked the the ground showing the release of anger. mmmm, I have just one question for the author... what do you think about the athletes that turns on the waterworks when the win? Is it ok for them to cry or shall they just be happy. Javier is obviously not a Brit, Terry is. Us Brits take the mickey (are sarcastic) about most things, including ourselves. 'A face only a mother could love' is in the same bracket as 'the perfect face for radio'. This tattoed scary monster ought to show a bit more backbone after trying to batter an oponent into submission. Wanting to beat another human being senseless and crying when you can't do so don't wash....pun intended.